I'm feeling nostalgic. Tomorrow will mark 3 years since I shipped my first game with the amazing team at Ubisoft Toronto, Splinter Cell Blacklist. To this day, it is still my favorite project and the one I remember the most fondly out of all those I've worked on so far. I grew immensely as both an artist and a developer on this project. In many ways, it was the launching pad for my career and I owe a lot to both this project and Ubisoft Toronto for how much I was trusted with despite it being my first shipped game. 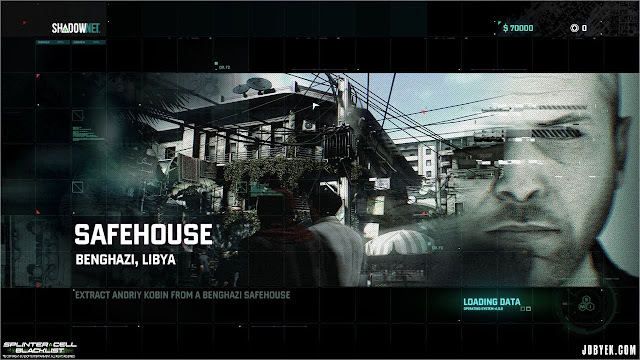 That said, I thought it would be fun to look back on the level that I worked on for the majority of production, the 'Safehouse' level set in Benghazi, Libya. Given that this was the first proper gameplay level after the initial tutorial level, we took the somewhat daunting task of making this level head on. 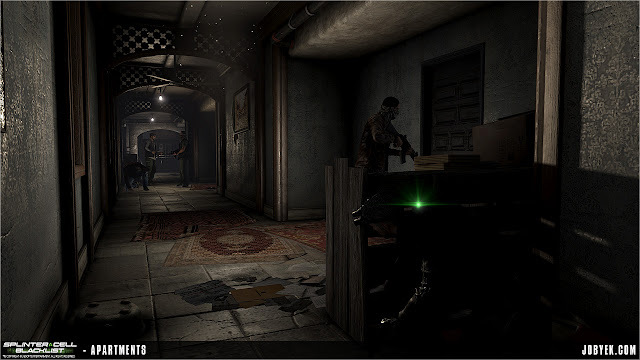 Being a 3D Modeler at the time, I worked on this level closely with my Level Artist, Jon Boujos, our Level Designer, Nick King, our Modeler/Texture Artist, Tim Bergholz and our Texture Artist, Pierre Thériault. Loading blog post...it's a long one, you've been warned. If you need a refresher of the map (or a first time look! ), here's a Perfectionist playthrough video. 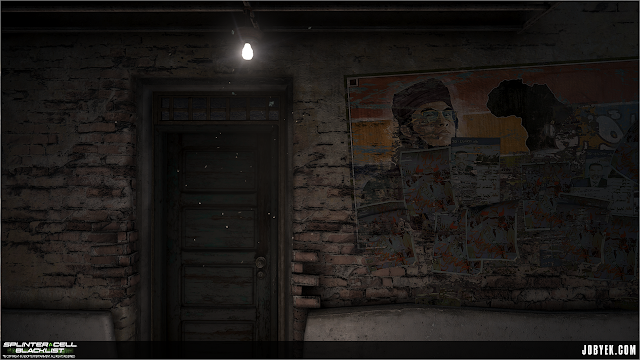 One thing you might have noticed playing through the level is that we barely had any assets with LODs in the level. If I recall correctly, virtually the only assets that had LODs were the great palm tree assets Tim Bergholz had made. The LEAD Engine (a heavily modified Unreal Engine 2.5), had a pretty robust occlusion system that handled 90% of our culling through hand-made occlusion meshes that lived in an invisible layer. The last 10% of assets missed by occlusion had their kill distances set by hand by both Jon Boujos and I as a fail-safe. Due to the relatively tight structure and design initially laid out by both Nick & Jon combined with our tight culling, this enabled us to really use up the memory afforded from not having LODs to push a lot more props and clutter on-screen compared to other levels all while still running at a solid 30fps. That said, were I to take another stab at the map today, one thing I wish we could have focused on more is push a lot more vistas throughout the map. We only revealed a bit of a vista at very key points due to the linear structure of the level, but in hindsight, we could have broken free from that more and make the level feel much larger than it actually was. Don't you just want to cover on this truck? I wish I could take credit for the idea, but as you might have guessed, it was a little thing I picked up from one of Shanghai's Embassy Co-Op maps. There was a garage in one of the maps with some running vehicles with their emergency lights flashing and it dawned on me...'Holy s***, why aren't we using this for our cover tutorial truck?!' (our truck originally had everything off). 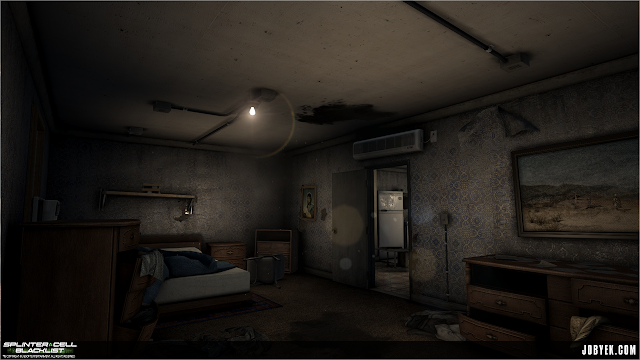 After a quick afternoon of running around and working with Lighting/VFX/Sound, we managed to get the implementation you see above in-game. In one fell swoop, all thanks to seeing a similar implementation in our game's Co-Op maps, we managed to lead the player to better reinforce our cover-to-cover mechanic in this tutorial section, sell the story that the mercenaries were keeping their truck running and loading it up and give some nice visual contrast to this heavily shadowed alleyway. For me, this specific example really changed the way I've approached development for these increasingly large projects we work on with Singleplayer, Co-Op and/or Multiplayer. Next time, do yourself & other mode's team a favor...play each other's content earlier (and periodically) in development! Feed off each other's differing creativity and ideas. Confession time. 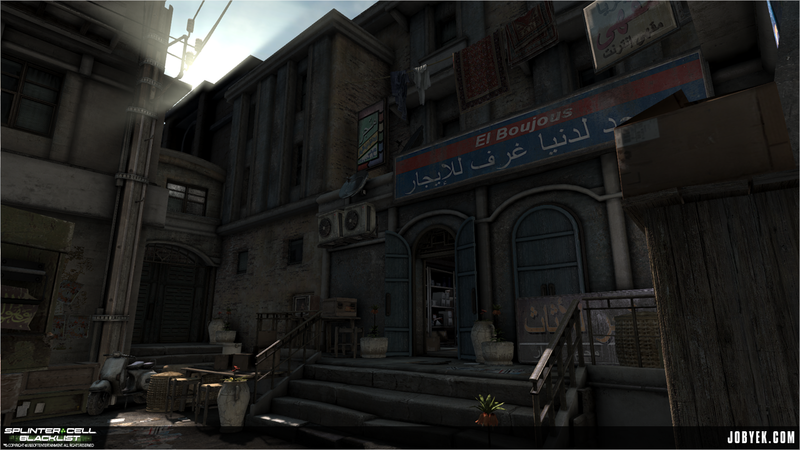 We almost shipped a section of our map running at ~25FPS on PS3. 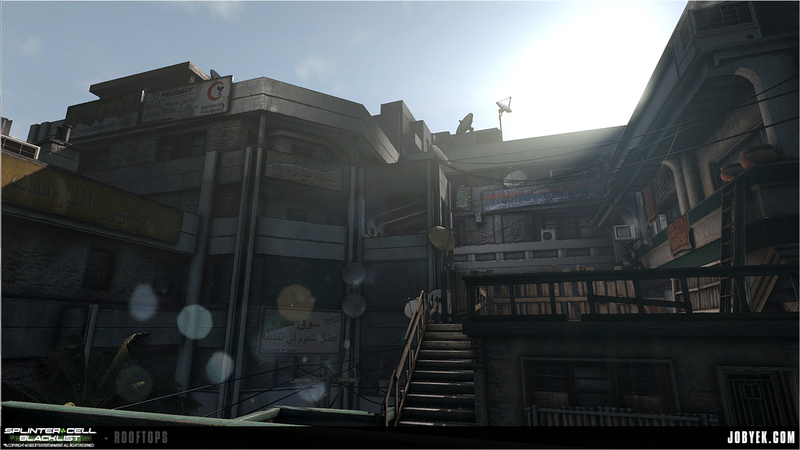 The exterior of the Police Compound near the end of our map was our last remaining big gameplay sandbox section running under performance. It was always eating me up inside that we still had one this one section left despite all the optimizations we did. Time was running out. I was the last person on our map and, while bug-fixing something in another Singleplayer map that day, I spotted a texture. A texture using a simple shader that was very similar to the expensive vertex-blended textures we were using in our under-performing area. With a bit less than an hour to spare before Art Content Lock, I made the very last minute decision to swap out the shader we were using on our street in that area for the shader of the texture from the other map. Visually, you could barely tell the difference. I built and launched the map on PS3, holding my breath. I get to the Compound area of the map. 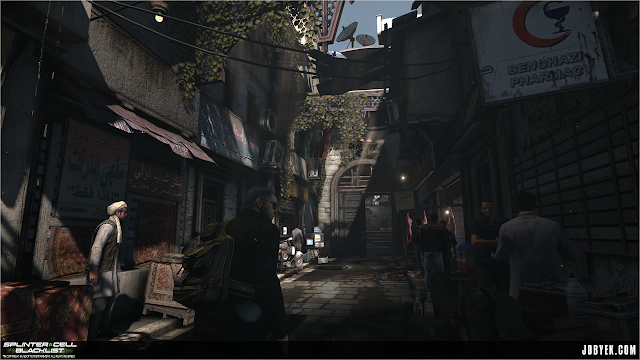 The whole area was now running at 30FPS on PS3. I can't tell you how much that of a relief that was checking that change in 10 minutes before Content Lock. So yeah, yes you can? Luckily, despite having to strip down the vert count of a lot of the assets to reduce overall memory for a given section (we literally combed through every asset to get savings), I didn't have to sacrifice much visual quality at all. Through these asset optimizations, I learned in a big way how not to be wasteful and how much proper Smoothing Groups/UVs/Material Splits go a long way to saving vertex count and mesh memory. So, even if we have 8GB of memory now, it's great to be mindful of things like that and squeeze even more on-screen! The late addition of the open window at the top became a great entry-point for the Tri-Rotor...and throwables! The sad part is that, in all likeliness, most players probably didn't even have the Tri-Rotor unlocked at this level (though you definitely have enough money to buy it). That said, for more open-ended sandbox games, I think that's just something you have to live with, players can't and won't see everything you've worked on. For me, even if there's just 1% of players who ended up finding our little Tri-Rotor entries and felt smart and creative doing so? That's worth it. One sneaky little bit of re-use we ended up doing in the map is between two apartment complexes you go through in the map at opposite ends of each other. One apartment complex you end up going through a little later in the map ended being finished before the first one. When came time to finish the first one at the beginning of the map, I was able to re-use two entire apartment sets almost wholesale with just some set dressing changes between the two to accommodate little bits of story. This ended up being a godsend for the 1st apartment as we were knee deep trying to wrap up that section of the map for our very first press demo of the game, which our map was apart of. One little caveat of re-using this same mesh was that it physically didn't actually fit in the 1st apartment building (woops). The interior and exterior didn't quite line up. In reality, if both the exterior and the interior of the apartment complex were loaded in the same time, you'd be seeing the walls of the interior protrude outside. 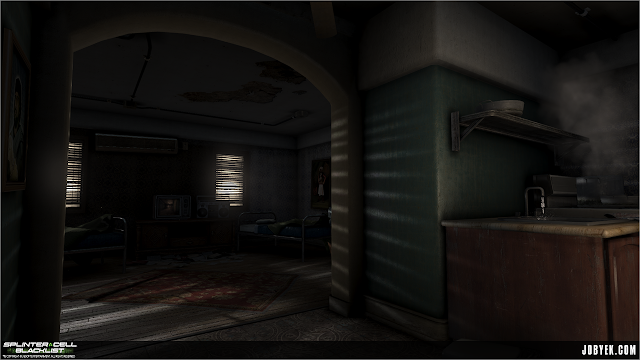 Given how our loading was set-up between sub-maps, that was luckily never the case, the exterior and interior of the apartment were never loaded together so we were able to get away with the slightly hacky re-use! 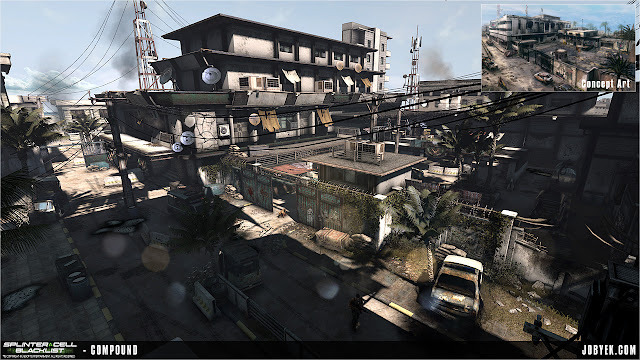 The intro of the map ended up being much better for it and got you to the action and gameplay faster. When we were brought into a meeting to announce that the section was being cut down, it was almost a relief for us to be honest. As a map team, we were feeling that the sequence was long for nothing for a while and were glad to we could focus better on the rest of the map. We knew that working on this map was going to be an uphill battle. 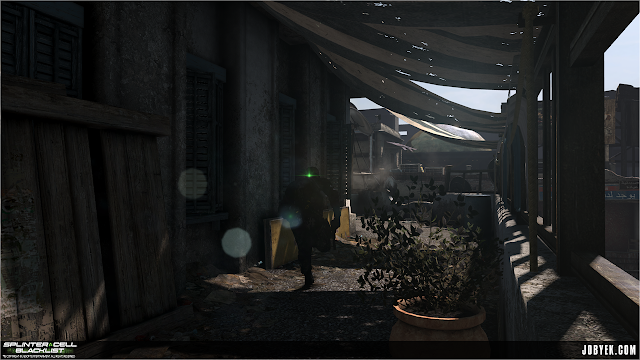 We knew that Splinter Cell purists would want to hang us...a Splinter Cell map in daytime?! We were conscious of it all the time and it's something we honestly took to heart as a map team. A lot of onus was put on us and the lighters to come up with interesting gameplay and lighting setups to support Stealth and Panther playstyles, whether in daylight or inside. It actually was a fun challenge to come up with creative ways to create natural pools of shadows for Sam to roam in...flapping cloth outside, a turned on TV inside casting shadows, etc. 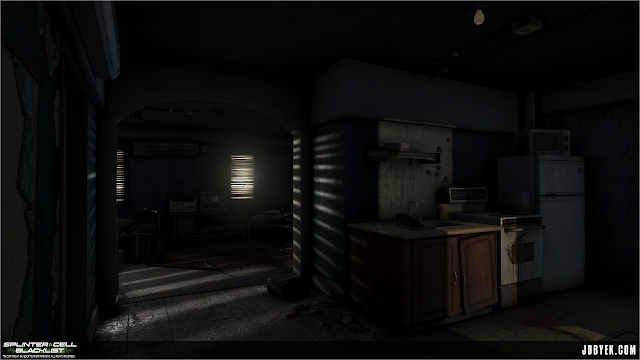 As you can see from most of the screenshots I've posted of the map (and more can be seen on my site), despite being a daylight map, the map oozes with dark inky shadows whether we're inside or outside and that was fully intentional. 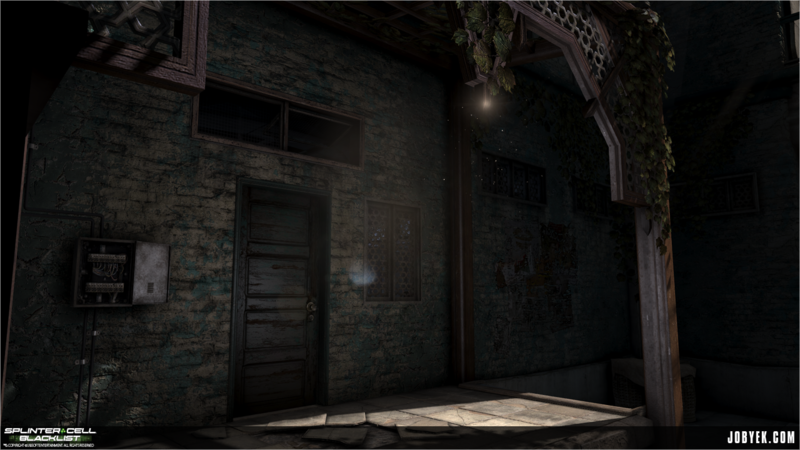 We wanted to prove that we could do a daytime Splinter Cell map well, and to a degree, I think we succeeded (though I may be biased!). One interesting issue that came up from us loving to use flapping cloth in our exteriors was that we realized that Sam wasn't registering as in shadow or stealth when under one. Turns out that in that engine, for a shadow to be recognized by Sam's light meter on his back (which turns on when in shadow/hidden), whatever was being shadow-casted had to have collision. So, one pass that I ended up having to do throughout the map was add invisible blocks of collision roughly the size of the flapping cloths to have those cloth shadows register properly. So if you run through those clothed areas...notice how his light meter turns on and off properly! The little details. Towards the end of development, Billy Matjiunis coined the term "smart polish". We were both the last two people on our respective maps, so we were debugging and closing the map for Goldmaster submission. Technically we were only supposed to be bug fixing and doing nothing else but...in between bug fixes, we were always sneakily fitting in as much polish as we could in our maps. Material tweaks here...a chamfered edge there...some more clutter here...we called it "smart polish", wherein we had to make doubly sure our ninja polish wasn't going to break anything or cause more bugs. Luckily, after having worked with that engine for so long at that point, we knew the right levers to pull. One bit of sneaky gameplay polish I ended doing quite a bit of was making sure we supported our little friend the Tri-Rotor as much as possible (and not in the typical ways you're thinking). The vents were all well and implemented, but I wanted to make sure the Tri-Rotor could go through everything that seemed like he was big enough to go through. One particular section of the map had a lot of wood slat walkways with pretty sizable holes that we couldn't really pass through with the Tri-Rotor due to them having very broad Navigation Collision (which the Tri-Rotor tested against). We originally kept the collision fidelity pretty low there for memory purposes, but by the end, we were in a pretty good spot, so I ended up defining the collision much more to enable Tri-Rotor navigation but also having to add an additional block of collision to still mainting player cover against the railings (you couldn't cover cleanly on non-rectangular collision). You can fly through all those railings! We actually had a couple of easter eggs in the map, both planned and unplanned. Did I ever mention I used to be a dictator? Ever heard of Saint Nick King? Have you been to Jon Boujos' shop? 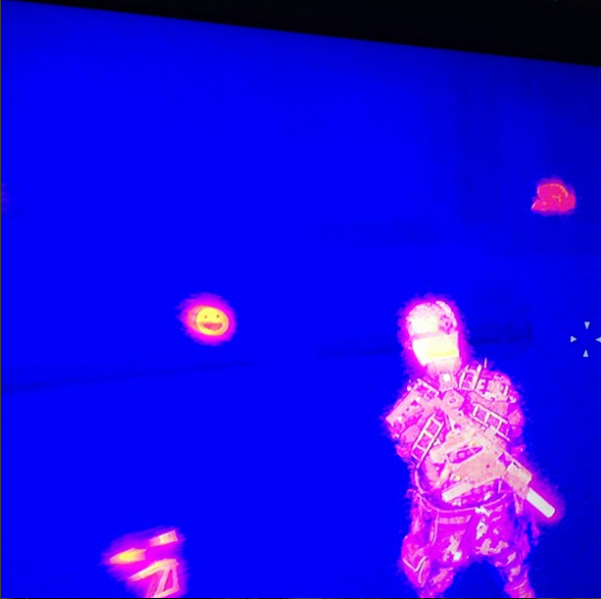 You had to have the most upgraded thermal goggles to see this. Whew. That was a long one (sorry!). I hope that, despite the 10 points being all over the spectrum, this was useful and/or fun to read through! It certainly was fun for me to remember a lot of these anecdotes and tidbits. If you ever have any questions, you can hit me up on Twitter @jobyek as usual! And on that note, here's to celebrating 3 years since ship with the Splinter Cell Blacklist team! That production was a hell of a ride and I'm still incredibly proud of what we've accomplished!